As we looked at the charter and bylaws, we identified a long-standing issue which we need to solve — there is currently no formal process to cover the “scope” of the Foundation in terms of which software we support with our resources. There is the release team, but that is only a subset of the software we support. We have some examples such as GIMP which “have always been here”, but at present there is no clear process to apply or be included in the Foundation. We need a clear list of projects that use resources such as CI, or have the right to use the GNOME trademark for the project. We have a couple of similar proposals from Allan Day and Carlos Soriano for how we could define and approve projects, and we are planning to work with them over the next couple of weeks to make one proposal for the board to review. We started the second day with a review of the proposed forecast from Neil and Rosanna, because the Foundation’s financial year starts in October. We have policies in place to allow staff and committees to spend money against their budget without further approval being needed, which means that with no approved budget, it’s very hard for the Foundation to spend any money. The proposed budget was based off the previous year’s actual figures, with changes to reflect the increased staff headcount, increased spend on CI, increased staff travel costs, etc, and ensure after the year’s spending, we follow the reserves policy to keep enough cash to pay the foundation staff for a further year. We’re planning to go back and adjust a few things (internships, marketing, travel, etc) to make sure that we have the right resources for the goals we identified. We had some “hacking time” in smaller groups to re-visit and clarify various policies, such as the conference and hackfest proposal/approval process, travel sponsorship process and look at ways to support internationalization (particularly to indigenous languages). The Board started Friday with a board-only (no staff) meeting to make sure we were aligned on the goals that we were setting for the Executive Director during the coming year, informed by the Foundation goals we worked on earlier in the week. To avoid the “seven bosses” problem, there is one board member (myself) responsible for managing the ED’s priorities and performance. It’s important that I take advantage of the opportunity of the face to face meeting to check in with the Board about their feedback for the ED and things I should work together with Neil on over the coming months. We also discussed a related topic, which is the length of the term that directors serve on the Foundation Board. With 7 staff members, the Foundation needs consistent goals and management from one year to the next, and the time demands on board members should be reduced from previous periods where the Foundation hasn’t had an Executive Director. We want to make sure that our “ten year goals” don’t change every year and undermine the strategies that we put in place and spend the Foundation resources on. We’re planning to change the Board election process so that each director has a two year term, so half of the board will be re-elected each year. This also prevents the situation where the majority of the Board is changed at the same election, losing continuity and institutional knowledge, and taking months for people to get back up to speed. Network services have incubated and driven most of the container usage on Linux up until now but they are fundamentally different to desktop applications. For services you can write a simple list of permissions like, “listen on this network port” and “save files over here” whereas desktop applications have a much larger number of touchpoints to the outside world which the user expects and requires for normal functionality. Just thinking off the top of my head you need to consider access to the filesystem, display server, input devices, notifications, IPC, accessibility, fonts, themes, configuration, audio playback and capture, video playback, screen sharing, GPU hardware, printing, app launching, removable media, and joysticks. Without making holes in the sandbox to allow access to these in to your app, it either wouldn’t work at all, or it wouldn’t work in the way that people have come to expect. What Flatpak brings to this is understanding of the specific desktop app problem space – most of what I listed above is to a greater or lesser extent understood by Flatpak, or support is planned. The Flatpak sandbox is very configurable, allowing the application author to specify which of these resources they need access to. The Flatpak CLI asks the user about these during installation, and we provide the flatpak override command to allow the user to add or remove these sandbox escapes. Flatpak has introduced portals into the Linux desktop ecosystem, which we’re really pleased to be sharing with snap since earlier this year, to provide runtime access to resources outside the sandbox based on policy and user consent. For instance, document access, app launching, input methods and recursive sandboxing (“sandbox me harder”) have portals. The starting security position on the desktop was quite terrible – anything in your session had basically complete access to everything belonging to your user, and many places to hide. Access to the X socket allows arbitrary input and output to any other app on your desktop, but without it, no app on an X desktop would work. Wayland fixes this, so Flatpak has a fallback setting to allow Wayland to be used if present, and the X socket to be shared if not. Unrestricted access to the PulseAudio socket allows you to reconfigure audio routing, capture microphone input, etc. To ensure user consent we need a portal to control this, where by default you can play audio back but device access needs consent and work is under way to create this portal. Access to the webcam device node means an app can capture video whenever it wants – solving this required a whole new project. Sandboxing access to configuration in dconf is a priority for the project right now, after the 1.0 release. Even with these caveats, Flatpak brings a bunch of default sandboxing – IPC filtering, a new filesystem, process and UID namespace, seccomp filtering, an immutable /usr and /app – and each of these is already a barrier to certain attacks. Hopefully from the above it’s clear that sandboxing desktop apps isn’t just a switch we can flick overnight, but what we already have is far better than having nothing at all. It’s not the intention of Flatpak to somehow mislead people that sandboxed means somehow impervious to all known security issues and can access nothing whatsoever, but we do want to encourage the use of the new technology so that we can work together on driving adoption and making improvements together. The idea is that over time, as the portals are filled out to cover the majority of the interfaces described, and supported in the major widget sets / frameworks, the criteria for earning a nice “sandboxed” badge or submitting your app to Flathub will become stricter. Many of the apps that access --filesystem=home are because they use old widget sets like Gtk2+ and frameworks like Electron that don’t support portals (yet!). Contributions to improve portal integration into other frameworks and desktops are very welcome and as mentioned above will also improve integration and security in other systems that use portals, such as snap. As Alex has already blogged, the freedesktop.org 1.6 runtime was something we threw together because we needed something distro agnostic to actually be able to bootstrap the entire concept of Flatpak and runtimes. A confusing mishmash of Yocto with flatpak-builder, it’s thankfully nearing some form of retirement after a recent round of security fixes. The replacement freedesktop-sdk project has just released its first stable 18.08 release, and rather than “one or two people in their spare time because something like this needs to exist”, is backed by a team from Codethink and with support from the Flatpak, GNOME and KDE communities. I’m not sure how fixing and disclosing a security problem in a relatively immature pre-1.0 program (in June 2017, Flathub had less than 50 apps) is considered an ongoing problem from a security perspective. The wording in the release notes? Allowing apps to become agnostic of their underlying distribution. The reason that runtimes exist at all is so that apps can specify the ABI and dependencies that they need, and you can run it on whatever distro you want. Flatpak has had this from day one, and it’s been hugely reliable because the sandboxed /usr means the app can rely on getting whatever they need. This is the foundation on which everything else is built. Separating the release/update cadence of distributions from the apps. The flip side of this, which I think is huge for more conservative platforms like Debian or enterprise distributions which don’t want to break their ABIs, hardware support or other guarantees, is that you can still get new apps into users hands. Wider than this, I think it allows us huge new freedoms to move in a direction of reinventing the distro – once you start to pull the gnarly complexity of apps and their dependencies into sandboxes, your constraints are hugely reduced and you can slim down or radically rethink the host system underneath. At Endless OS, Flatpak literally changed the structure of our engineering team, and for the first time allowed us to develop and deliver our OS, SDK and apps in independent teams each with their own cadence. Disintermediating app developers from their users. 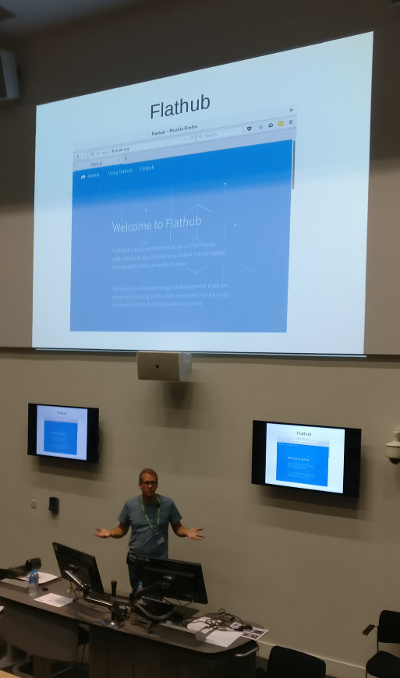 Flathub now offers over 400 apps, and (at a rough count by Nick Richards over the summer) over half of them are directly maintained by or maintained in conjunction with the upstream developers. This is fantastic – we get the releases when they come out, the developers can choose the dependencies and configuration they need – and they get to deliver this same experience to everyone. Decentralised. Anyone can set up a Flatpak repo! We started our own at Flathub because there needs to be a center of gravity and a complete story to build out a user and developer base, but the idea is that anyone can use the same tools that we do, and publish whatever/wherever they want. GNOME uses GitLab CI to publish nightly Flatpak builds, KDE is setting up the same in their infrastructure, and Fedora is working on completely different infrastructure to build and deliver their packaged applications as Flatpaks. Easy to build. I’ve worked on Debian packages, RPMs, Yocto, etc and I can honestly say that flatpak-builder has done a very good job of making it really easy to put your app manifest together. Because the builds are sandboxed and each runtimes brings with it a consistent SDK environment, they are very reliably reproducible. It’s worth just calling this out because when you’re trying to attract developers to your platform or contributors to your app, hurdles like complex or fragile tools and build processes to learn and debug all add resistance and drag, and discourage contributions. GNOME Builder can take any flatpak’d app and build it for you automatically, ready to hack within minutes. Different ways to distribute apps. Using OSTree under the hood, Flatpak supports single-file app .bundles, pulling from OSTree repos and OCI registries, and at Endless we’ve been working on peer-to-peer distribution like USB sticks and LAN sharing. Nobody is trying to claim that Flatpak solves all of the problems at once, or that what we have is anywhere near perfect or completely secure, but I think what we have is pretty damn cool (I just wish we’d had it 10 years ago!). Even just in the security space, the overall effort we need is huge, but this is a journey that we are happy to be embarking together with the whole Linux desktop community. Thanks for reading, trying it out, and lending us a hand. As you all know by now, exciting moves from Google on the WebM project have lead to them open-sourcing On2’s VP8 codec to provide a freely available video codec for HTML5 content. Collabora Multimedia worked with Entropy Wave to add support to GStreamer for the new codec from day 1, and I was really happy yesterday to update my Debian system and get the support installed locally too. Thanks to our and Igalia’s fine work on GStreamer HTML5 support in WebKitGTK+, Gustavo Noronha found it worked out of the box with Epiphany too. Predictably, the MPEG-LA aren’t too pleased with this, and are no doubt winding up their PR and industry allies at the moment, as well as this opening a new front on the Apple vs Google ongoing platform battle. But if your business model is collecting money through what is essentially a protection racket and spreading FUD about patent litigation, the VP8 license implicitly creating a zero-cost zero-revenue patent pool is not going to be good news for you (from the department of Google deleting your business model). The question is now whether the allure of Google’s content will win over against the legal chest pounding of the patent trolls, and whether they start flipping switches to make YouTube only serve up WebM content after a while. Also in amazing and incredible news, Collabora’s Telepathy/GStreamer/GNOME/Debian/general R&D guru and staunch Web 2.0 holdout Sjoerd Simons has actually now got a blog after a mere 3 years of us suggesting it to him since he joined Collabora as an intern. He’s been hacking on some RTP payloader elements for VP8 so we can use it for video calling on the free desktop. All very exciting stuff, especially in conjunction with Muji (multi-user video calls over XMPP) support heading into Telepathy thanks to NLNet‘s ongoing support. Flyby blog entry. Been an awesome week, hope people enjoyed the Collabora party last night. Getting to the GNOME Shell BOF this morning was a real struggle, but I really like the way its going. We’ve scheduled an Empathy BOF for Friday at 15:45 in room 2-4, hoping to talk with folks about improving the accounts UI, tracker/addressbook and GNOME Shell integration. Aside from that, we’re planning to hack on Empathy for basically the whole day, looking at MC5 porting and UI polish, so there will be a big load of Collabora folks and friends somewhere. Will update when I know where.